Astree Sternhjelm, an attractive Swedish woman vacationing in Puerto Rico with her matronly aunt, Ana, is seduced by the music, colour and apparent freedom offered by life in the tropics. Her humourless aunt, on the other hand, can’t wait to catch the boat home to Stockholm and “civilized life”. Towards the end of their visit, they find themselves in a small village on the occasion of the annual corrida. Aunt Ana is disgusted by the barbarous spectacle, but Astree is both attracted and repelled by the violence; when the young bullfighter is gored, she urges the local aristocrat Don Pedro de Avila to step in and save him. She almost faints at the sight of the dashing Don Pedro killing the bull with a single sword-thrust to the head, but she can’t get him out of her mind. A couple of days later, as the ship is about to sail, Astree abandons her aunt and rushes back on shore where she falls into Don Pedro’s arms. Ten years pass. Back in Sweden, Aunt Ana has cut all contact with her errant niece. She has also established an institute for the study and treatment of tropical diseases, which is about to send an expedition to Puerto Rico to tackle a fever which plagues the island. Two doctors are going: Luis Gomez from Brazil, and Sven Nagel from Sweden. 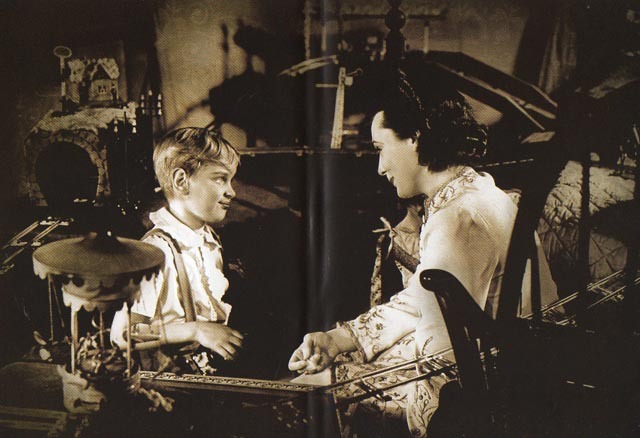 Dr. Nagel happens to be an old flame of Astree’s and Aunt Ana asks him to bring her back at last. When we meet Astree again, she is a melancholy wife and mother. Don Pedro is a brutish, overbearing despot who keeps his hold on her with threats of violence and the fear that he will take their 9-year-old son, Juan, away from her. She longs to return to Sweden with the boy as the tropical paradise has turned out to be a tropical hell. Don Pedro is now the foremost political power on the island and is determined to prevent the doctors from doing their research. Eight years earlier an American team from the Carnegie Foundation had come to study the fever, eventually producing an antidote which didn’t actually work. Bad publicity about the disease had devastated the economy, so now those in power are determined to follow a course of strict denial. There is no illness, and there will be no studies which risk further publicity. So every year, when the fever winds blow, hundreds die anonymously. As Astree and Dr. Nagel reconnect, Don Pedro’s jealousy is aroused and he determines to have the foreign researchers arrested and deported. Astree pleads with Nagel to help her escape. The doctors, working day and night in secret in their hotel room, discover a genuine antidote to the fever. But while they are attending a large ball at Don Pedro’s estate, the authorities break into their rooms and take all their materials. Don Pedro is abruptly struck down at the party by the fast-acting fever, falling into a coma. The doctors call for the antidote they have created, but are told that at Don Pedro’s orders everything was destroyed. Nothing can be done. Don Pedro dies and Astree and her son leave the island forever with the doctor, a more suitable companion and guardian for a civilized woman. La Habanera (1937) is an overwrought melodrama, rife with implausible plotting, but of real interest because it was the final film directed by Detlef Sierck (soon to be renamed Douglas Sirk) before he fled Germany and the Nazi regime. 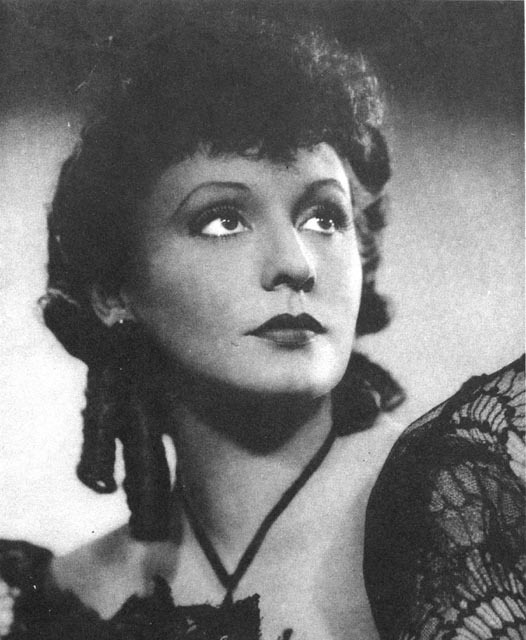 It was also the third German feature to star Zarah Leander, the Swedish actress who became the Third Reich’s biggest star despite Goebbels’ resentment that she was not German. Leander was best known as a deep-voiced singer, but in this film Sirk brought out her qualities as an actress, and in some ways she is a direct precursor to his suffering middle class protagonists of the ’50s, Jane Wyman in Magnificent Obsession (1954) and All That Heaven Allows (1955) in particular. While Leander does get to sing a couple of times in the film, it offers her greater scope to display a deep masochistic passivity requiring rescue by the noble Swedish doctor from her brutish Hispanic husband. 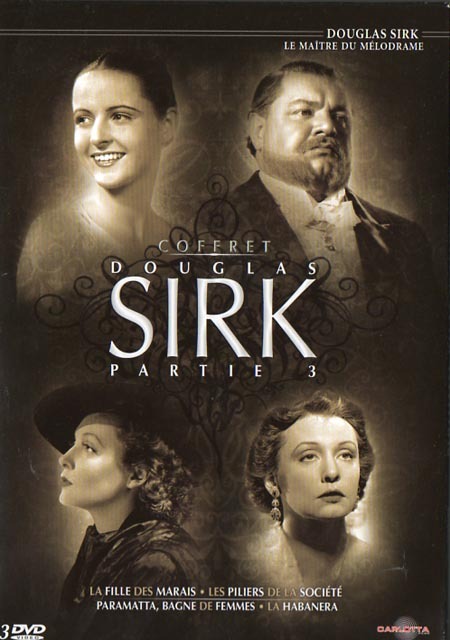 Interestingly, there is none of the critique of bourgeois oppression which is at the heart of so many of Sirk’s Hollywood melodramas. In fact, this film displays a fear of anarchy and social freedom and longs for a return to the strict rigidity of European “civilization”. And it is here that it becomes impossible not to see La Habanera through a filter of historical knowledge (made even more impossible by the fact that I recently read Eric Rentschler’s The Ministry of Illusion: Nazi Cinema and Its Afterlife [Harvard University Press: Cambridge, 1996] which devotes a chapter to the film). Despite the narrative displacements (Leander plays a Swede, not a German), the film offers a clear warning about stepping outside the bounds of racial purity, of being seduced by the decadence of a lesser culture. Astree learns a hard but important lesson: the inferior races are corrupt and dangerous and doomed to their own destruction, so best to stick with the security (and purity) of higher, European (ultimately German) civilization. 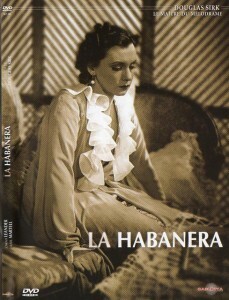 In this sense, La Habanera is virtually diametrically opposed to the view of “civilization” in the great ’50s melodramas, a world in which individuals are crippled and crushed by the forces of conformity. Did Sirk actually believe what he was saying in his final German film, and eventually come to question that view in light of what happened over the next decade? Or was he a working craftsman who merely did his best with what was required of him by an already ideologically dictated approach to popular entertainment? According to Sirk’s own account (in Sirk on Sirk: Interviews by Jon Halliday [The Viking Press: New York, 1972]), he actually proposed making La Habanera as a means to get out of Germany “because life was becoming absolutely impossible.” He was given travel documents which enabled him to get to Tenerife for the filming, but not a passport which would be necessary to get into the States. He finally managed to escape the next year via Italy (with the help of some nuns) and Zurich. Note: I was only able to see La Habanera thanks to the Internet and computer technology. When I was in Paris this past summer, I couldn’t resist picking up a DVD boxed set of four of Sirk’s German films, even though they only included French subtitles. Back home in Winnipeg, I used some software to rip the DVDs and convert them to AVI files. Then, a search of several Internet sites got me SRT subtitle files for three of the four films. Burning the AVI files along with the associated SRT files to a DVD, I was able to play the movie (in somewhat diminished, highly compressed quality) on one of my multi-region players, an otherwise very unsatisfactory Momitsu … sometimes I’m really grateful for all this technology! 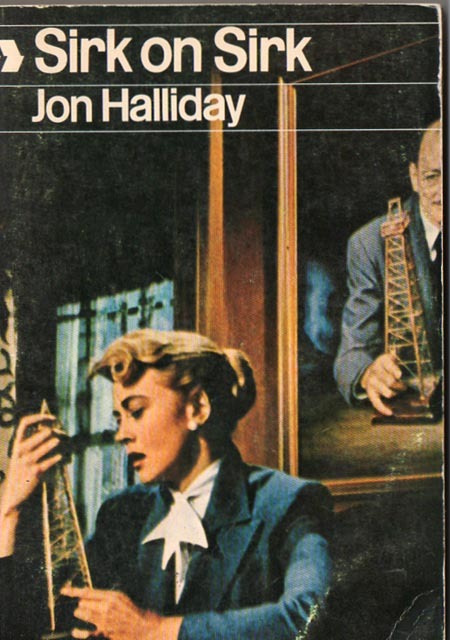 This entry was posted in Review and tagged AVI, Douglas Sirk, DVD, German film, Zarah Leander. Bookmark the permalink.